First time traveling with South African Airways and I must say I'm quite impressed by the quality. Well, I could be a little bias because of our front row seats with plenty of leg space (thanks to the waitlist issue mentioned in my previous post). Landed at Johannesburg airport at 9am. The airport wasn't fancy but at least going through immigration was easy. Same as the US, we had to collect our bags and recheck-in at the counter for our domestic flight to Cape Town. Thanks to the United Club membership, we were able to use the South African Airways Domestic Lounge to rest and get some breakfast during our 3-hour transit. The lounge was pretty basic. They were serving breakfast when we were there. We could have taken a shower if we wanted but we spent our time using the internet instead. Took an airside bus to get to the plane for Cape Town. This leg was a short one, only 2 hrs. Cape Town and Table Mountain from the air. 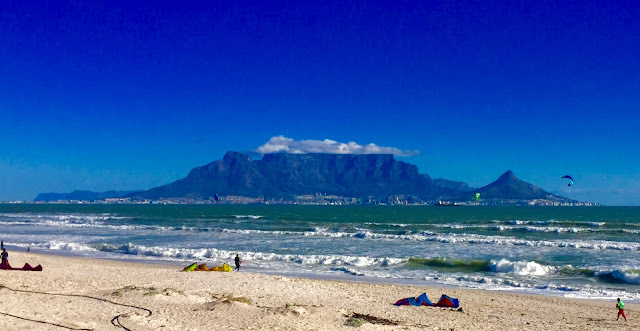 Our 3 nights at the DoubleTree in Cape Town cost only 15,000 HiltonHonors points per night. The hotel is located at the newer neighborhood of Woodstock, about 10 minutes away from downtown. The service provided by the hotel staff was excellent. I received an email from the hotel informing that I was double-upgraded to a Loft Suite even before we arrived. On top of that, we received warm cookies, welcome platter, and a welcome note...very nice!! The King Deluxe Loft Suite with Kitchenette was huge! The first level had a separate living and dining area, a kitchen equipped with microwave and fridge, and floor to ceiling windows with views of Cape Town. The 2nd level had the king-sized bed, a spacious bathroom with a separate bathtub, walk-in shower and heated towel rail. So fancy!!! After quickly admiring the amazing loft and dropping our bags, we headed out for some sightseeing before the sun sets. The original plan was to take the cable car up to Table Mountain but we were a bit behind schedule and it was a cloudy day, so we decided to go straight to Bo-Kaap instead. The Bo-Kaap neighborhood is a largely Muslim community, and is known for its brightly colored houses. Next stop...made it to Signal Hill just in time to catch the sunset! 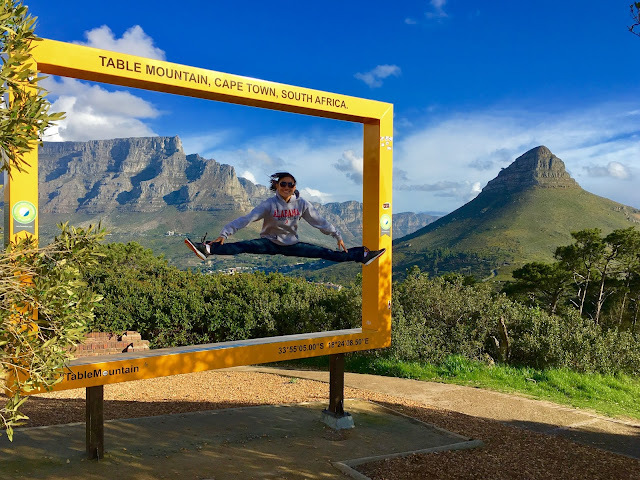 Signal Hill is also one of the best places to see Table Mountain and Cape Town. Just in case you're wondering why the jacket and hoodie in August, it's actually winter in Cape Town. The winter in Cape Town is considered mild, but it was chilly up on the mountain. Looking at the clouds at Table Mountain, we were glad we decided not to go up. The Beer House had pretty good reviews online so we decided to have dinner here. P.S. There are so many restaurants with good reviews all around Cape Town! Ordered the Beer Explorer tasting tray. Burger and Beer...hubby's favorite combo. =P All these cost ZAR351 ($26), not bad at all! This place is known for 99 bottles of beers, with cool beer-themed designs (the keg sink). The Old Biscuit Mill was only 1km away from our hotel but it's not the best area in town to walk so we drove there. We were lucky to be there on a Saturday for the Neighbourgoods Market. The atmosphere was vibrant and there was a wide variety of food made by local vendors. However, we were still full from breakfast so it was just sightseeing for us. After a quick walk around the Old Biscuit Mill, we continued our journey to Sea Point. Notice how quickly the weather changed...from blue skies to dark skies. It started pouring when we got to Camps Bay and the mountains were covered with mist, so we decided to wait in the car for the rain to pass. Patience wins! Hello again blue skies! Now that the skies are clear, it's time to begin our Chapman's Peak drive. The drive was pretty easy as there weren't too many cars on the road. This is a toll along this route and it costs only ZAR45 ($3). We drove from the west side of the Cape Peninsula through the mountains to the east side, where the Boulder's Penguin Colony is located. I didn't realize that we'll need to pay entrance fee to get to the viewing platform until we got there. SInce we couldn't get close to the penguins from the viewing platform anyway, we decided to walk along the board walk (for free) instead and saw the penguins up close. Randomly drove up this hill (Boyes Dr) with a view of Kalk Bay. Muizenberg Beach...famous for the colorful huts (similar to Brighton Beach in Melbourne). The chilly waters don't seem to stop the surfers from coming out to surf. Look at the beautiful rainbow!! After our last stop along the coast at Muizenberg beach, it was time to head back into the city and visit the V&A waterfront, the most-visited destination in South Africa. V&A Waterfront is basically a big shopping area with restaurants, music, and this big ferris wheel. With such beautiful weather, we decided to drive back to Signal Hill for more photos. What a huge difference comparing these photos with the ones we took the day before, I love blue skies! Can't miss taking photos with this iconic 'photo frame'. After a successful day of sightseeing, we had dinner at Devil's Peak Taproom, which was conveniently located only 500m from our hotel. Another round of beer and burger for hubby, while I opted for the big bowl of mussels. Total cost of this meal was ZAR329 ($25). We made reservation for the wine tasting, but apparently it wasn't necessary as we were the only ones there...lol! We had the entire restaurant for ourselves and had 'personalized' service for the wine tasting. Honestly, both of us don't know much about wine, but I did some 'homework' before the trip and had a shortlist of wines that we may want to buy home. We were given a list of red, white, rose, and dessert wines to choose from. The standard tasting allowed us to choose 5 wines each, so essentially we could have tasted 10 wines between the both of us but we duplicated some. The cost for standard tasting (5 wines) is only ZAR50 ($4) per person, and it's free if you make minimum purchase of ZAR100. We bought 4 Pinotage Rose, a Gewurztraminer (white wine), and a Shiraz (red wine). The bubble wraps ended up costing more than the wines...lol! And yes, we lugged these all around the world without breaking 'em. Another vineyard with equally great view is Tokara Winery. We parked near Tokara Delicatessen and hopped out for a quick photo. These mountains make great background for photos. After some wine tasting and vineyard sightseeing, we stopped for lunch at The Thirsty Scarecrow. The restaurant overlooks a strawberry farm with interesting scarecrow decorations, and a great view of the mountains. Best part, they have their own strawberry beer. This place was filled with locals when we were there...guess we found the right place to eat and drink. =P Wine in the morning, beer at lunch...sound like we're alcoholics...lol!! Total cost for this meal - ZAR195 ($15). After lunch, we left Stellenbosch and started our hunt for canola fields. I saw some pretty photos on instagram of canola fields, and they should be blooming this time of the year. It was quite an adventure searching for a canola field...which involved driving on the dirt road above with no cars and nothing around us. Finally found a canola field at this area called Philadelphia (no not the US one). Gotta reward ourselves with some photos after all the effort searching for this field!! On our way to Bloubergstrand beach, we drove by a shopping area and this Nando's drive-thru caught my eye. It has been so long since I had peri-peri chicken and I was happy to find it here. I also found out that Nando's actually originated from South Africa, more reason to try it in its origin country! Hubby opted for the McD next door. Total cost for both our meals - ZAR110 ($8). 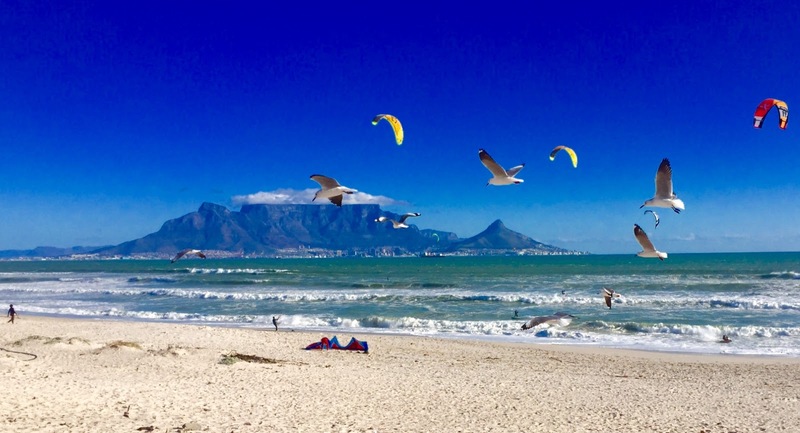 Our last stop for the day and also for this trip was Bloubergstrand Beach, famous for the view of Table Mountain and wind surfers. Bidding goodbye to Cape Town like the birds. We enjoyed our time here and this city definitely didn't disappoint! Our final day in Cape Town was a chillaxing one. Spent the morning chilling and packing in the hotel, and drove back to the airport at 2pm to return the rental car. 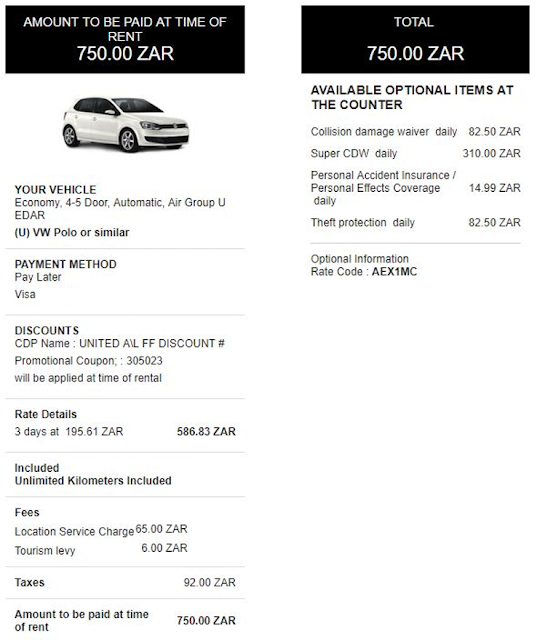 A reminder for anyone renting a car in Cape Town, make sure you fill up your car at the gas station closest to the airport and keep the receipt. The rental car people will request for it when you return the car. Now time to hop on another 12 hours red-eye flight back to Europe. That's all for this long post. Thank you Cape Town for the beautiful scenery and weather!